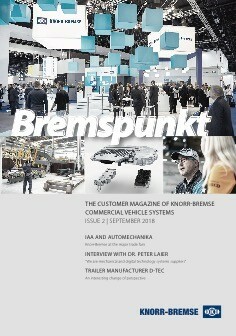 BREMSPUNKT (“Braking Point”), the customer magazine from Knorr-Bremse Commercial Vehicle Systems, was launched in 2004 to further improve our contact with you, our customers. It is published up to four times a year in German. In a brief and entertaining fashion, Bremspunkt hopes to put the focus on helping you provide competent advice to your customers, save costs or design your work processes more efficiently. Bremspunkt provides information on product development, innovation and testing; in addition, it offers technical recommendations, giving your company an information head-start. Bremspunkt also serves as a communication forum for the partners of Knorr-Bremse Commercial Vehicle Systems where they can present their companies and express their opinions on relevant topics. If you’d like to share recommendations or comments, send them to the Bremspunkt editorial team at bremspunkt@knorr-bremse.com.